VOL. 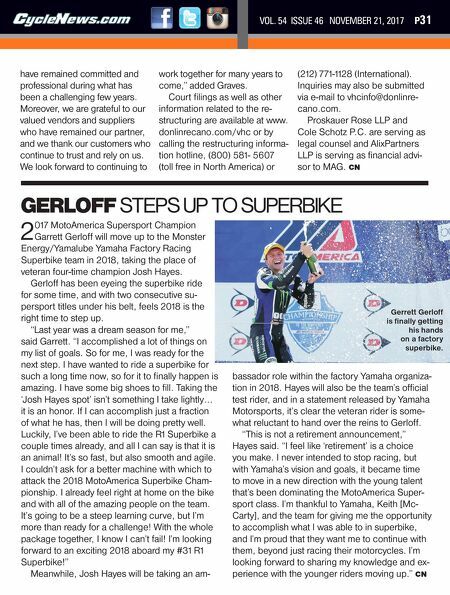 54 ISSUE 46 NOVEMBER 21, 2017 P31 GERLOFF STEPS UP TO SUPERBIKE 2 017 MotoAmerica Supersport Champion Garrett Gerloff will move up to the Monster Energy/Yamalube Yamaha Factory Racing Superbike team in 2018, taking the place of veteran four-time champion Josh Hayes. Gerloff has been eyeing the superbike ride for some time, and with two consecutive su- persport titles under his belt, feels 2018 is the right time to step up. "Last year was a dream season for me," said Garrett. "I accomplished a lot of things on my list of goals. So for me, I was ready for the next step. I have wanted to ride a superbike for such a long time now, so for it to finally happen is amazing. I have some big shoes to fill. Taking the 'Josh Hayes spot' isn't something I take lightly… it is an honor. If I can accomplish just a fraction of what he has, then I will be doing pretty well. Luckily, I've been able to ride the R1 Superbike a couple times already, and all I can say is that it is an animal! It's so fast, but also smooth and agile. I couldn't ask for a better machine with which to attack the 2018 MotoAmerica Superbike Cham- pionship. I already feel right at home on the bike and with all of the amazing people on the team. It's going to be a steep learning curve, but I'm more than ready for a challenge! With the whole package together, I know I can't fail! I'm looking forward to an exciting 2018 aboard my #31 R1 Superbike!" Meanwhile, Josh Hayes will be taking an am- bassador role within the factory Yamaha organiza- tion in 2018. Hayes will also be the team's official test rider, and in a statement released by Yamaha Motorsports, it's clear the veteran rider is some- what reluctant to hand over the reins to Gerloff. "This is not a retirement announcement," Hayes said. "I feel like 'retirement' is a choice you make. I never intended to stop racing, but with Yamaha's vision and goals, it became time to move in a new direction with the young talent that's been dominating the MotoAmerica Super- sport class. I'm thankful to Yamaha, Keith [Mc- Carty], and the team for giving me the opportunity to accomplish what I was able to in superbike, and I'm proud that they want me to continue with them, beyond just racing their motorcycles. I'm looking forward to sharing my knowledge and ex- perience with the younger riders moving up." CN have remained committed and professional during what has been a challenging few years. Moreover, we are grateful to our valued vendors and suppliers who have remained our partner, and we thank our customers who continue to trust and rely on us. We look forward to continuing to work together for many years to come," added Graves. Court filings as well as other information related to the re- structuring are available at www. donlinrecano.com/vhc or by calling the restructuring informa- tion hotline, (800) 581- 5607 (toll free in North America) or (212) 771-1128 (International). Inquiries may also be submitted via e-mail to vhcinfo@donlinre- cano.com. Proskauer Rose LLP and Cole Schotz P.C. 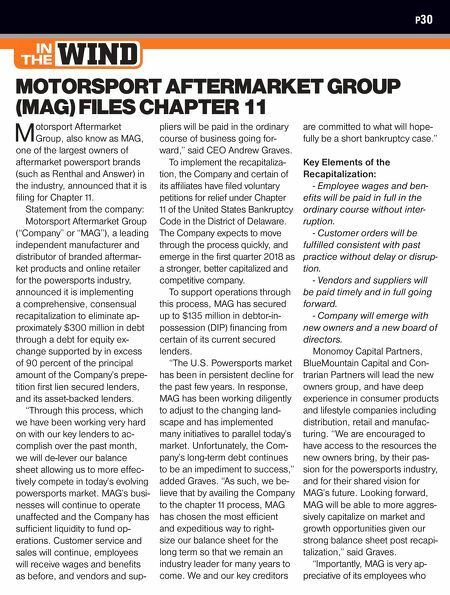 are serving as legal counsel and AlixPartners LLP is serving as financial advi- sor to MAG. CN Gerrett Gerloff is finally getting his hands on a factory superbike.